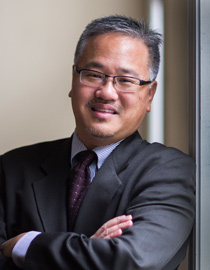 Max Lee is associate professor of New Testament at North Park Theological Seminary in Chicago. Our upcoming issue of the Quarterly took early shape in Max’s course, Reading the Bible Interculturally. We talked with Max to explore further his academic and personal commitment to intercultural readings of Scripture. Max, outside of being a professor and scholar, tell us a little bit about yourself. What do you do in your free time? What I want to do is reach the gym and make a heroic attempt to keep myself in shape, but alas, much of my day, evenings, and late nights are spent managing the tension between my vocation as a professor and my investment in my two teenage sons. I hope and pray that they will grow up to be godly men. When I’m on top of my game, my sons and I all make it to gym and run the treadmill, pump iron, and cool down at Starbucks after we are done. There is a genuine joy in gleaning insight from Scripture and sharing this with others. I love sharing what I learn, and I love learning from those with whom I share. If the Lord uses what I teach to inspire, encourage, challenge, and transform my students, and they, in turn, share what they learn with others through their preaching and ministry, my joy, in the words of Apostle Paul, becomes complete. When did you first come across the subject of intercultural biblical interpretation? What drew you to studying it further? My first formal exposure was in 2002, through my participation in the Korean Biblical Colloquium which meets concurrently with the Society of Biblical Literature each year. At KBC, I engaged with scholars who shared different hermeneutical commitments than my own, but nevertheless challenged me to think about how the social and cultural location of the reader affected biblical interpretation. While I did not apply the same post-colonial methods of interpretation my colleagues and friends at KBC did, I started to ask what an evangelical framework would look like for the biblical scholar who interpreted the Bible interculturally. How does one move from the historical setting of the ancient text to the modern context of the real reader? I’m still trying to work out a model for how evangelical Christianity can engage the task of intercultural biblical interpretation. So this special issue in the Covenant Quarterly in many ways functions as an initial sounding board, subject to further reflection and revision. Within this field, what topic(s) are most in need of further development and study? As I mention in my article, there are two areas that warrant further study: (1) the cultural histories of Asian Americans, Latino/a Americans, African Americans, and other ethnic groups living in the United States, and (2) how the biblical interpreter committed to historical criticism might engage in the task of reading Scripture for a particular social and cultural location. It is the integration of these two fields in an interdisciplinary model that screams for further research and development. The average person in our congregation knows neither well. Most have grown up with a Euro-American perspective on the history of the United States. How many of us know, for example, that the early immigration laws in America were drawn unfairly on racial lines. The Naturalization Law of 1790, for example, said that only “white” immigrants could become naturalized citizens? Therefore Asian immigrants were considered “foreign,” “alien,” and ineligible for U.S. citizenship. The prejudices against non-white immigrants have deep roots and feed some current suspicions against immigration practices. Knowing these histories should therefore help us to understand ourselves and our neighbors better. Christians are rightly concerned not to “read into” Scripture a message that the text does not support. But do we “read from” Scripture a message that is applicable to the real-life struggles of those whose life circumstances and culture are different from our own? Much work still needs to be done where we read Scripture as a historically contingent text, whose message is communicated under the agency of the Spirit and is interpreted for the culturally specific situation of the real reader. Do you have any parting wisdom or words for our readers? Only a word of appreciation for taking the time to patiently read the articles of this issue and not immediately dismissing the topic as irrelevant nor unneeded. May the Lord bless and challenge you with the task of preaching his word to every nation, tribe, people, and language! Read Max Lee’s Quarterly article, “Reading the Bible Interculturally: An Invitation to the Evangelical Covenant Church and Evangelical Christianity,” at covquarterly.com (link). In true Covenant fashion inclusion rules the day and I am glad. This Issue has challenged my thinking regarding the precise -imprecise?-use of hermeneutical terminology. Without respect to culture or social status, in my view, there can only be one correct interpretation/meaning for the text, an interpretation/meaning that albeit can be open to debate, but nonetheless only one correct interpretation/meaning. Otherwise Scripture is reduced to useless nonsense. However, if there is agreement to the essential idea of a single correct interpretation/meaning for the text, then multiple applications from the text are absolutely possible, in my view. I do look forward to following the unfolding of this discussion.